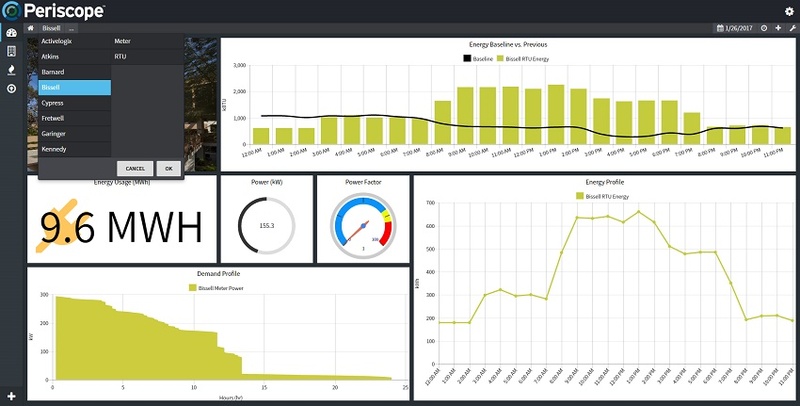 Built to analyze/visualize data from smart devices and systems found in and around buildings. Activelogix has recently released its third generation of Periscope tools built to analyze/visualize data from smart devices and systems found in and around buildings. In a few short years, the abundance of data available from building devices has grown exponentially. Many tools built in the last decade have struggled to adequately anticipate this growing volume of data and the labor associated with using many of these traditional tools has increased. But as always, when the industry is challenged, leaders step up and provide solutions. Many ideas have been put forth, but only a few meaningful solutions have momentum and will help us solve these real world data issues and improve user/owner satisfaction. One such important solution for our industry is Project Haystack (http://project-haystack.org/). Project Haystack is an open source initiative to streamline working with metadata from the Internet of Things. The community helps define and standardize semantic data models and web services with the “goal of making it easier to unlock value from the vast quantity of data being generated by the smart devices that permeate.” Think of metadata as “data about the data.” For instance, the temperature can be DEG F or DEG C. Temperature can be measured in a room sensor or on the equipment air discharge, etc. Typically the more critical or valuable space or equipment becomes, the more data is gathered and presented. Big Data without context can ultimately be a burden, but data with context can be a gold mine, and many industry professionals are acting on it. As the Haystack Community continues to define the semantic data models, it creates more opportunity for professional organizations to unlock the value in the data for various stakeholders. Critical or wasteful data patterns demand attention from management and lead to cost savings and productivity gains. These patterns may lead to a design change in the next facility or large savings across an enterprise or chain. Forward-thinking product manufacturers would be wise to support the Haystack standards when making changes to equipment and adding instrumentation. At Activelogix, our new Periscope technology uses Haystack as the underlying data model. It is allowing us to build software that runs on both Niagara4 and SkySpark; two of the leading IoT platforms. When configured appropriately, Periscope uses metadata to intuitively make an assumption about the data which greatly reduces the labor required in our tool and process. For example, once a view is built for an energy meter, it can be reused across other sites that also have a meter by simply changing the Site Name. This features saves configuration time and creates a consistent story about how the data changes. Creating your own tag dictionary - a custom tag dictionary can be created which allows defining custom non-Haystack tags. For example, a smart city may wish to tag all police stations with a "police" tag. This dictionary would hold the "police" definition which isn't native to Haystack. Implied tags - implied tags are automatically applied to components based off of smart rules which can take the component type, properties, or placement within the station into consideration. For example, implied tags could be used to map naming conventions to haystack tags for automatic batch tagging. Periscope Database view - the Database view allows users to manually manage tags or create Haystack records in an intuitive web-based interface. By using the above tools, Integrators will be able to tag systems faster than ever. It's also recommended that you create a new Smart Tag Dictionary to hold any proprietary tags for your system as well as implied rules for automation. Finally, the Database view can then be used to finish tagging where automation of tags wasn't possible. Many building owners and contractors are missing out on the myriad of business benefits that proper metadata management offers including reducing the cost and time to manage facilities and deliver projects, identifying and prioritizing savings and improvement opportunities, or finding the proverbial needle in a haystack; all of which directly lead to better overall business performance. At Activelogix, we’re committed to the continual support of new standards, technologies and products that systems integrators and end users can utilize to improve building performance.